These two twits are Richard and Carlton the Narragansett turkey boys. They arrived via the SD&G OSPCA on March 9, 2014. Their former owner kept snakes to which he fed turkey chicks, but for some reason, he got attached to these two and let them grow into magnificent turkeyhood. However, the turkeys took to running around the Cornwall, Ontario neighbourhood they lived in and flying up on people's roofs. And since turkeys perhaps aren't the best city pets, their owner kindly brought them to the OSPCA, where the staff have us on speed dial under the label "SUCKERS." We took in these two terrible Toms and we quite like them, but most of the people who help us with barn chores here would like to see Richard & Carlton on the Thanksgiving dinner table (not gonna happen!) They do have a rather annoying habit of sneaking up behind you and pecking the backs of your knees, which is particularly unpleasant if you are wearing shorts. Once in a while they go all "Sean Penn," but really they are a pair of feathered pussycats. I think it's completely unreasonable to arm yourself against them with a self-defensive shovel, as our barn helper Kim does! Don't worry, she doesn't whack them with the shovel, just uses it to push them back from her when they are being annoying, as opposed Jackie, another barn helper who actually cuddles these two fools. Sadly, Richard went on to that great turkey graveyard in the sky in early 2018, but Carlton lives on with fond memories of his brother. In February 2014,we adopted five chickens from the same barn Ophelia the pig was seized from. We named them Bonnie, Julie, Debbie, Lemay, and Carol after some of the women who work at the SD&G OSPCA. Then one day Carol crowed and became... MR. Carol! On September 2, 2016, we adopted Gracie the pot-bellied pig from the SD&G OSPCA. Gracie was born in 2010. She was surrendered to the OSPCA. She apparently spent some time living in a house, then was banished outside to a filthy, junk-filled pen. She had been living on Ol’ Roy dog food, Triscuit crackers, and reconstituted pea-soup mix when we got her. We are hoping that she won’t suffer long-term health effects from this completely inadequate diet. Fortunately, she polished off her first bowl of pot-bellied pig food in no time. Gracie was very overweight when she arrived, which can lead to blindness in pot-bellied pigs, and is also very hard on their joints. Her weight on arrival was an estimated 275 - 300 pounds, and to move her from the OSPCA truck to her pen (in a crate), we had to use our tractor with a pallet and forks. Fortunately Gracie has now slimmed down to a perfect size, and is currently the most athletic of any of our pigs! It is a joy to see her run around the pasture without getting out of breath after a few steps. appropriate food, four acres of pasture, and lots of rooting around and rolling in mud baths. Olive arrived from Rimouski, Quebec with her friends Lillian and Lloyd on December 5, 2017. They were in a bad situation in their former home, and needed a new place to live. Soon after the three goats arrive, we began to eye Olive and her friend Lillian suspiciously. When the vet came to do their vaccines, we had him do ultrasounds on Olive and Lillian. No buns in the oven for Lillian, but Olive was preggars. The vet guesstimated that she might give birth in two to three months. Instead, she had twins on January 5, 2018, in the bitterly-cold goat house on a day with a windchill of -38C. She had two doelings, Anna and Elsa, who would soon have frozen to death had my farmer helper Stephanie not stumbled across them in time. 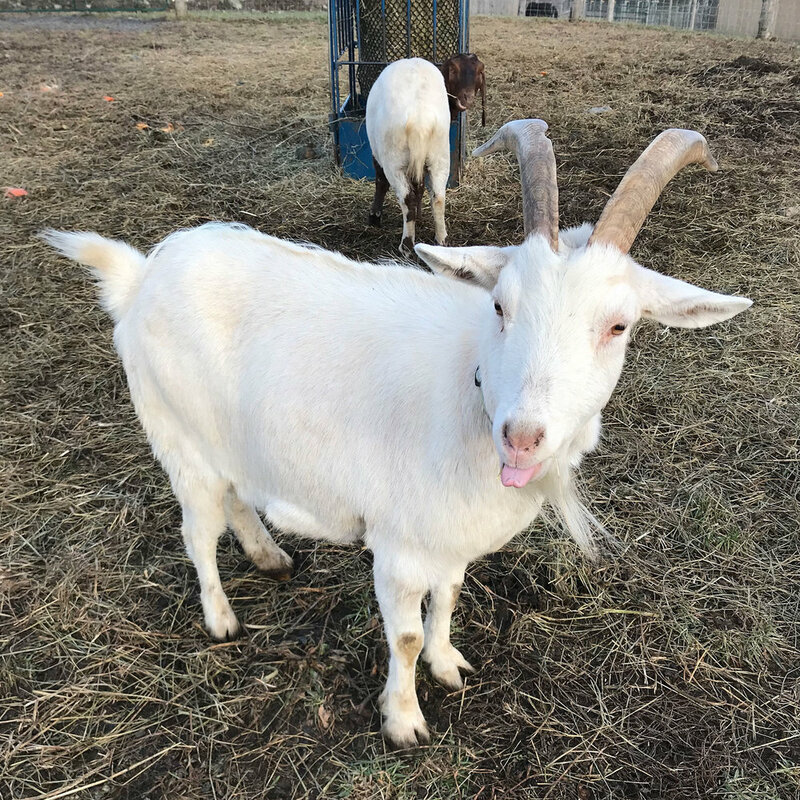 Olive is not only an excellent Maa-Maa, she is a sweet, quiet, affectionate goat. We are so glad to have her and her little bundles of joy! Lillian arrived from Rimouski, Quebec with her friends Olive and Lloyd on December 5, 2017. She is a real beauty! We thought she might be pregnant when she arrived, but apparently she just has a beaudacious figure. Lillian loves to eat Christmas trees. She is also a fan of neck-scratched. She enjoys hanging out with her buddy Lloyd. She thinks our Maremma Monty is the devil incarnate. This cute little dude is Pierre, born to Bambi along with his sister Emmeline on March 21, 2016. He is a gentle little guy who likes a good scritch between the horns. He has a calm personality and would prefer munching on alfalfa to locking horns with big Kevin. This goaty fellow is named after my friend and beekeeping mentor, the human Pierre. Look into his eyes and you'll be mesmerized! Luc is one of Penny's triplets born on January 9, 2016. He and his two sisters were partially bottle-fed and are all super-sweet and friendly. Luc has a gorgeous face with a big white blaze. He is laid-back and quiet, and likes to hang around with his sisters Rosie and Annabelle. He is an excellent big brother and keeps an eye out for his sisters. Little Luc is named after our human friend Luc, who does freelance work at our farm and also helps take care of the animals when needed. Human Luc is now the goats' personal farrier! Annabelle is one of Penny's triplets born on January 9, 2016. She is the image of her maa-maa, except she has two brown front legs in front of one brown and one white like Penny. She is very outgoing and loves to nuzzle and greet visitors. When she was little, we thought it was adorable when she jumped up and put her front feet on us. Of course she's still doing it now that she's almost as big as her maa-maa! Still cute, now with extra impact. Annabelle enjoys nibble hair and sampling the brims of expensive cowboy hats. Hawkeye was born March 16, 2016 and is one of Genny's twins and the brother of Debbie. Hawkeye and Debbie had an interesting birth. We were on high alert for their arrival that March because Genny was hugely pregnant, but we didn't know her exact date of conception. So on the morning of March 16, I asked Gordon to check Genny carefully before letting her outside with the other goats (she was spending her nights in a kidding pen.) Gordon let Genny out, then left for work. Half an hour later, I went outside with her car keys in hand, ready to dash off to an appointment, when I heard... a baby goat crying! Yes, sometime in the 30 minutes that elapsed after Gordon released Genny, she dropped her twins in the mud with an audience of curious goats and pigs looking on. I scooped up the screeching babies and led Genny inside, eyed the blood and afterbirth splattered all over my clothes, then cancelled my appointment. Fanny came to the farm as a foster cat on November 23, 2017. She was not supposed to stay. She was supposed to be adopted out to a wonderful home that would make her forget her past. She was rescued from a hoarding situation. The two other cats that were living with her were euthanized due to their poor condition. Fanny was removed from that home, then spent weeks living in an empty condo, hiding in a cupboard, while a place was found for her. When Fanny finally arrived here, she hid in a box for a couple of weeks. It turned out that she has a mouth full of rotten teeth and sore gums. We took her to the vet, where she had several teeth pulled. Later we had her spayed and vaccinated. She is somewhere between 5 and 12 years old, according to the vet, so who really knows? Now that Fanny is free from pain, she is the most friendly, affectionate, wonderful little soul. And yes, she is a foster-fail. Fanny lives in our granary and is a wonderful addition to our farm. And she doesn't hide in boxes any more! Our farm manager Luc insists on calling her Rusty. This wily gal was born to Bambi along with her brother Pierre on March 21, 2016. She has a "lightning bolt" on her forehead, and has been know to move at the speed of that meteorological phenomenon. She also had a heart on her back. She has caused bloody knees and muddy faces for those who hit the ground while trying to round her up for a veterinary visit. Our miracle kid, Rosie is one of Penny's triplets born on January 9, 2016. She nearly died soon after she was born, as we didn't realize quickly enough that Penny wasn't producing adequate milk for the three kids. We managed to raise Rosie's body temperature by putting her in a garbage bag, securing it around her neck, and carefully immersing her in a kitchen sink full of very warm water. Then we swaddled her limp body in blankets and left her in a warm bathroom, fully expecting to come back from the barn to find a corpse. Instead we returned to a wide-eyed kid looking for a meal. Rosie and her siblings were all bottle-fed milk replacer as well as drinking off their mama, to ensure they got enough to eat. Penny was in poor shape when we arrived at our farm pregnant. It's amazing she produced these three beautiful kids! Rosie is named after a local goat-keeper who came over on a moment's notice to help us save her life. We are forever grateful for her help, and that of our friend Debbie, in saving little Miss Rosie. Debbie was born March 16, 2016 and is one of Genny's twins and the sister of Hawkeye. She looks a lot like her Boer/Nubian cross maa-maa. She has a beautiful face with pretty markings and stunning eyes. Debbie was named after our human friend Debbie, who was one of two people instrumental in saving Rosie the goat kid's life. Debbie and Luc the humans are partners in real life, but their goat namesakes are just friends. In July 2015, we adopted Neil the Splash Orpington rooster and his three ladies, all seized from the same place as our goats. He is one big, handsome rooster and he is very attentive to his girlfriends. He is modest about his good looks and doesn't push the other roosters around. 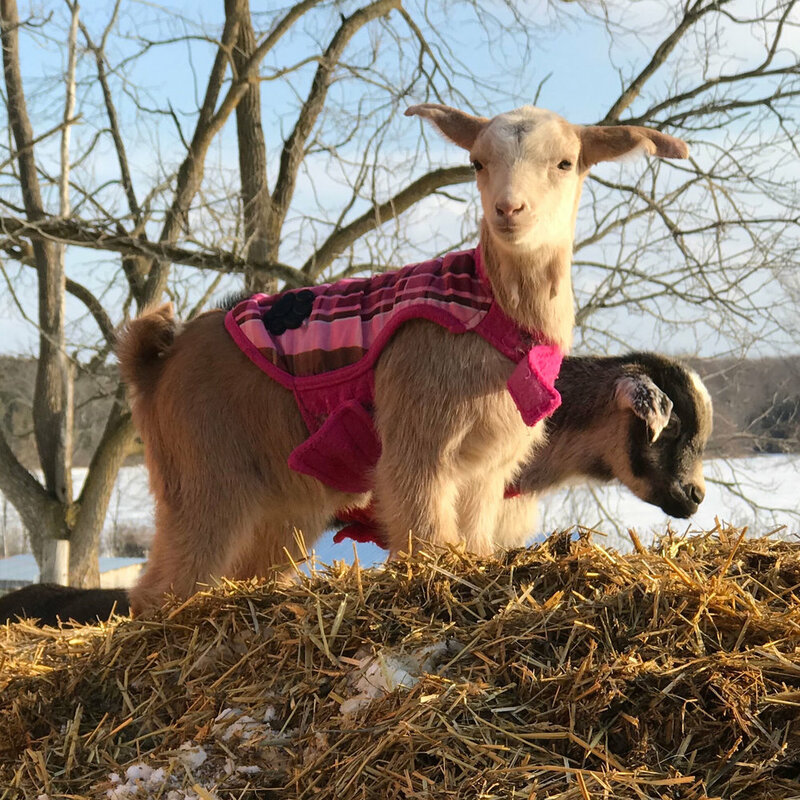 Anna and her sister Elsa came along as excess baggage in Olive's tummy when we adopted three goats from Rimouski in December, 2017. ON January 5, 2018, Anna and her sister Elsa surprised us by arriving a couple of months earlier than the vet had predicted. Because they were born in the frigid cold, the two kids take their names from the characters in the movie Frozen. We have no idea who her daddy is. Anna is growing a nice little set of horns, unlike her sister Elsa who was born without horns. Lloyd arrived from Rimouski, Quebec with his friends Olive and Lillian on December 5, 2017. They were in a bad situation and needed a better place to live. Lloyd is a nice, easy-going guy with an impressive set of horns. He's got a lovely silky beard, too. He looks exactly like a miniature version of our goat Harry! Like Lillian, Lloyd is not fond of our Maremma Monty, but he tolerates him because he realizes Monty is in fact preferable to a coyote. Copyright 2019 Natalie Rowe unless otherwise noted.